Hey Lovelies! 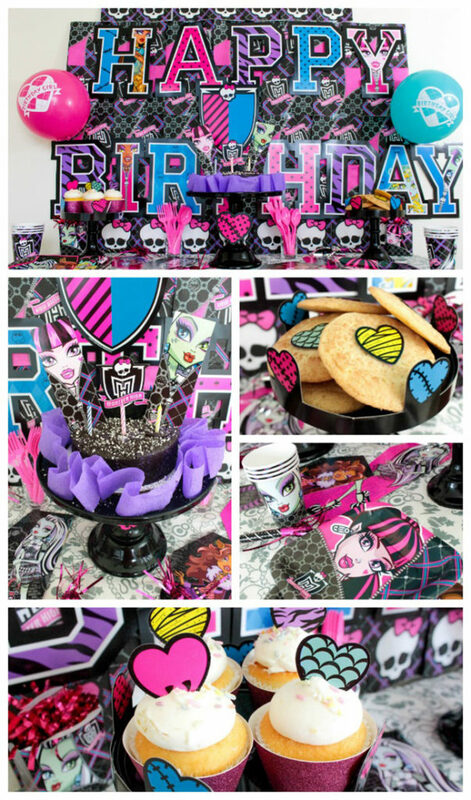 We have teamed up with Mattel and Evite to bring this fangtastic Monster High party to share with you today with all sorts of inspiration and eye candy. 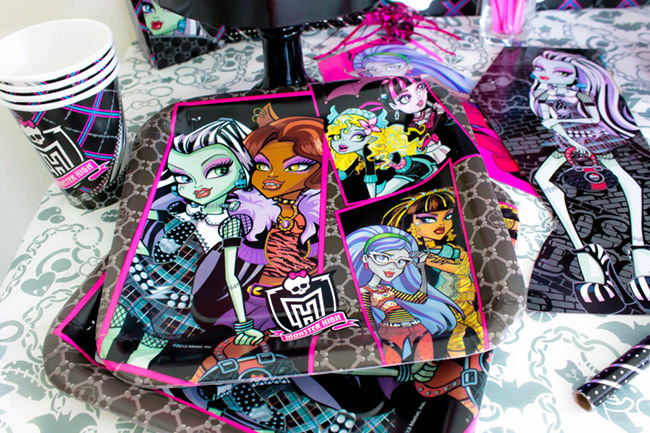 We love all of the fun characters of Monster High like Frankie Stein and Draculaura. We also love that Monster High is a place where students embrace and celebrate what makes them different. Each Ghoul and Manster has unique qualities to love and embrace. 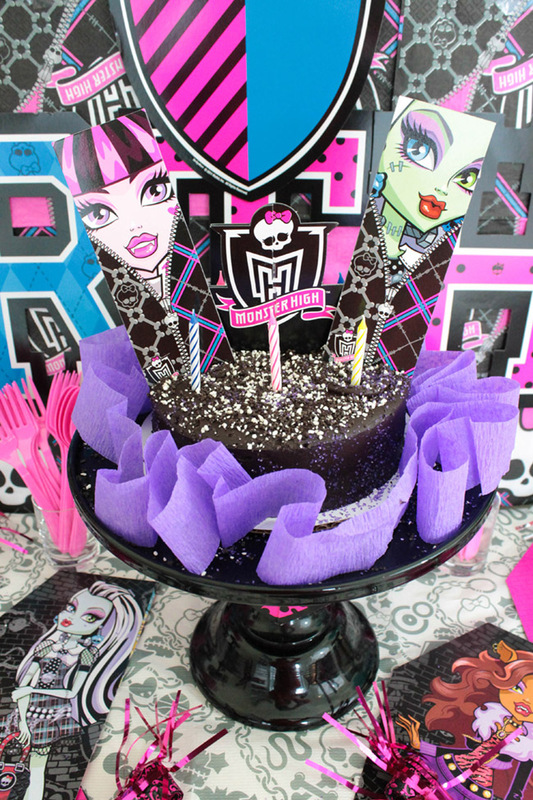 Monster High Parties are so fun because they have so many adorable and cute details. The color palette is fabulous to work with too. Pink, blue, and black make such a wild and vibrant color combo. Plus, when you add fun patterns in there, like argyle and plaid, it really pops! We can’t wait to show you our Monster High birthday party and the best news is we will show you exactly how we put it together! 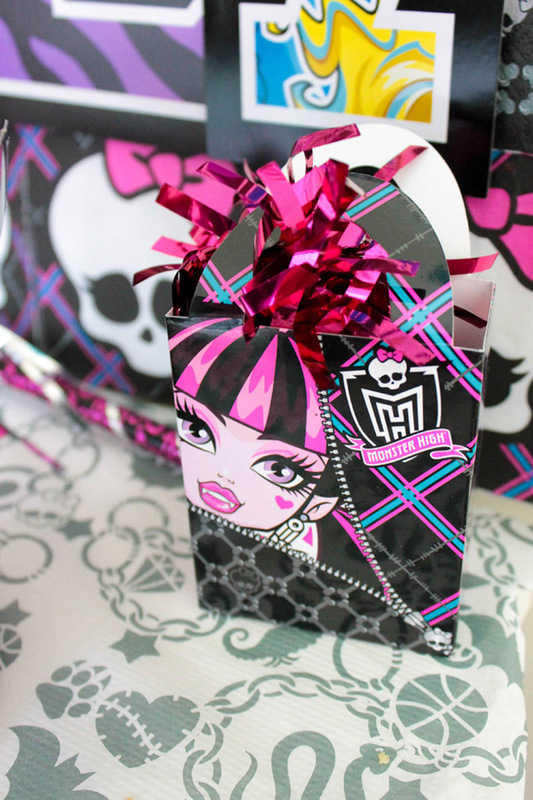 The first thing you need to throw a Monster High Party is an invitation! 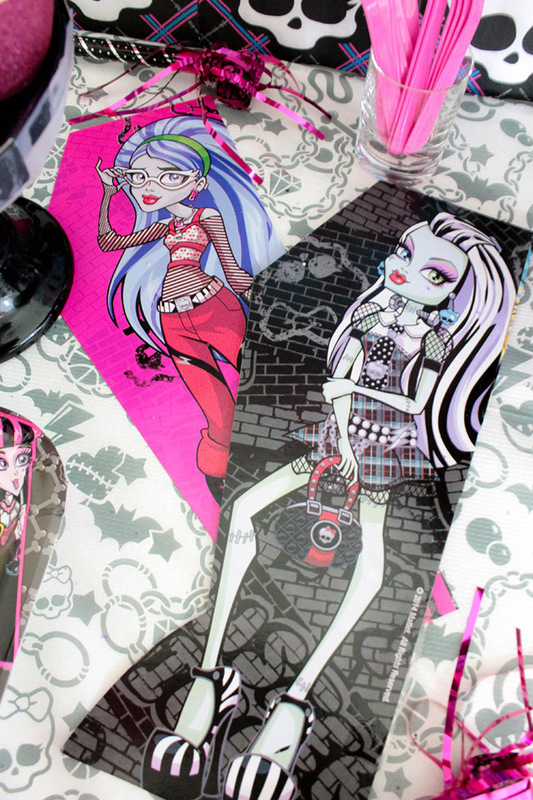 Tell your guests all about the party with these epic Monster High invitations from Evite. They are really cute. They have different fun designs to choose from, all with your favorite ghouls on them, and they can all be customized with your party dates and info. They are all really too cute! We love all of the bright and bold patterns of the invites and it is so easy to customize any design. Just put in your party info, finalize your design and send off your invite. 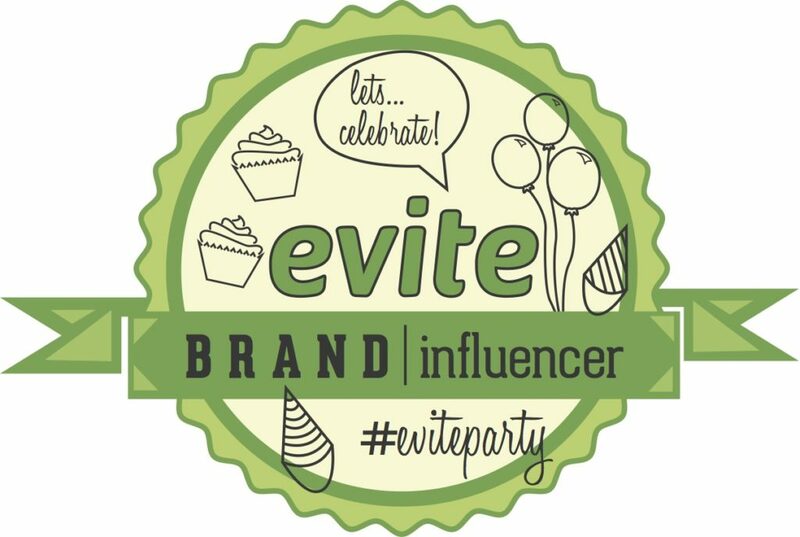 It can all be done through Evite and that is one less step you have to think about when you are planning your party. Plus, as you know, when you send an Evite invitation, you aren’t just sending any old email invite, you get a ton of services that go with it like your own party feed where you and your guests can share messages and photos. The news gets even better! You can win $250 for your next party if you send a Monster High invitation. If you send an Evite Monster High invitation from this link you will automatically be entered for a chance to win a $250 gift card for your next party. In order to win participants must actually send an Evite invitation. Now to the party details! Like we said, Monster High Ghouls and Mansters have a lot of bold and vibrant colors, and patterns, so we really wanted to show that off with this party. The good news is you can get Monster High party supplies straight from Mattel. They have everything that you could ever need to throw a party! 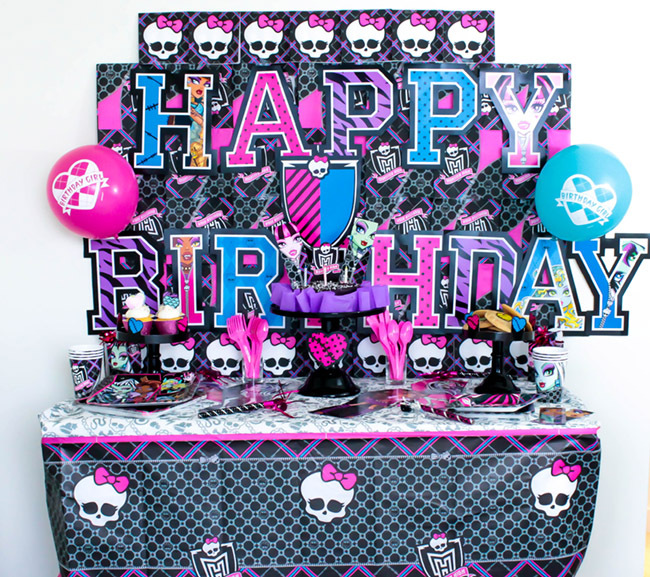 We just love this fun Monster’s High tablecloth that is the perfect base to our dessert party table. Another great touch to any dessert party table…a lovely backdrop. This one is made from party napkins! We just lined up napkins in a row and attached them to the wall. We just love the way it turned out. 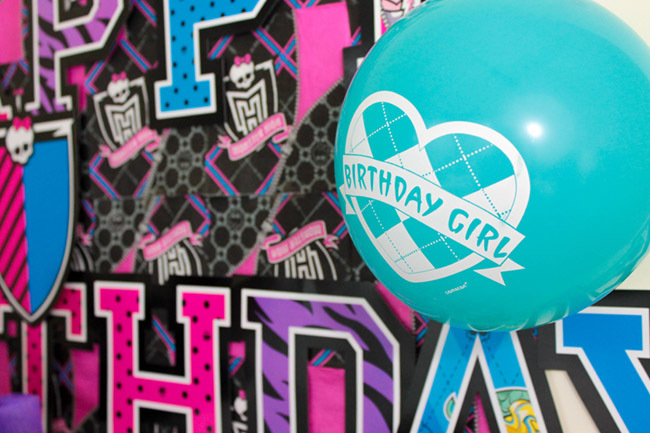 It’s the perfect backdrop to this larger than life Monster High Happy Birthday banner. It’s definitely a great way to set the tone for a birthday party. 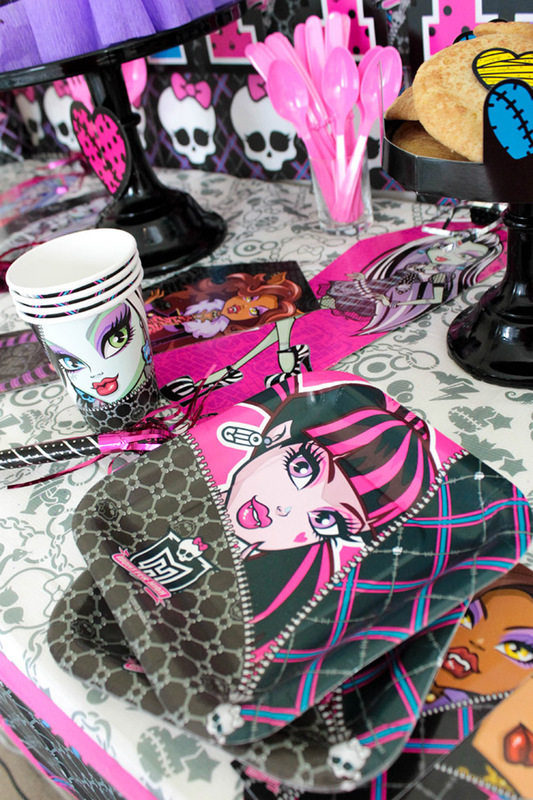 These Monster High plates and cups are perfect to show off the different Party Ghouls at your party. Look how cute these bags are with Draculaura on them. They are perfect to hold helium balloons or to add a bit of loveliness to your table. Look how cute these balloons are! Display your forks and spoons in creative ways will bring that wow factor to your dessert table! 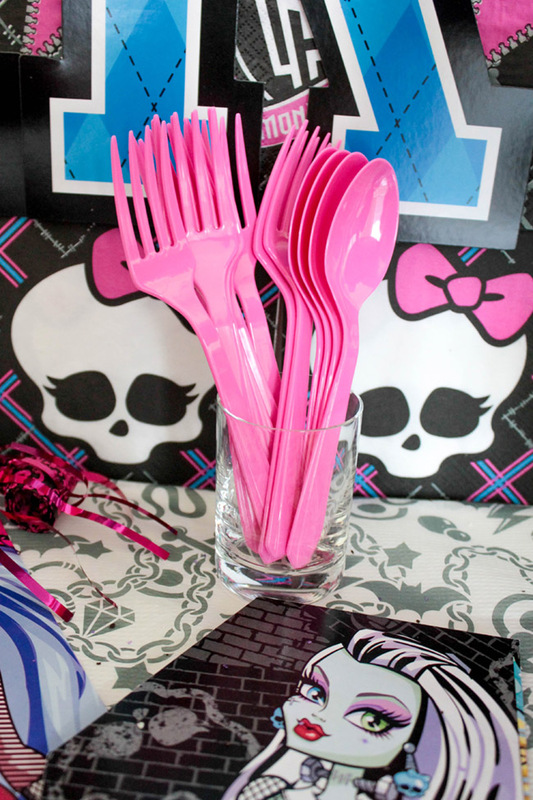 Mattel has all sorts of different Monster High party supplies to deck out your party look. The party Ghouls were part of a centerpiece that we disassembled to add some more character to our dessert table! No party is complete without a cake! 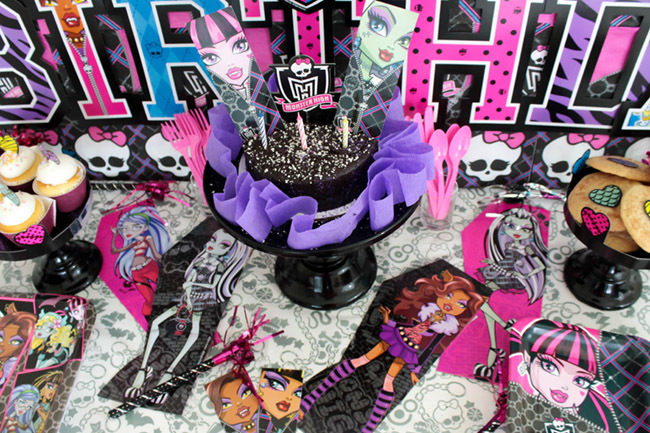 Even small cakes can be sure to impress when you dress them up with Monster High Ghouls, candles and sprinkles! We love dessert tables with all sorts of different options, so of course cupcakes had to be on the menu too! 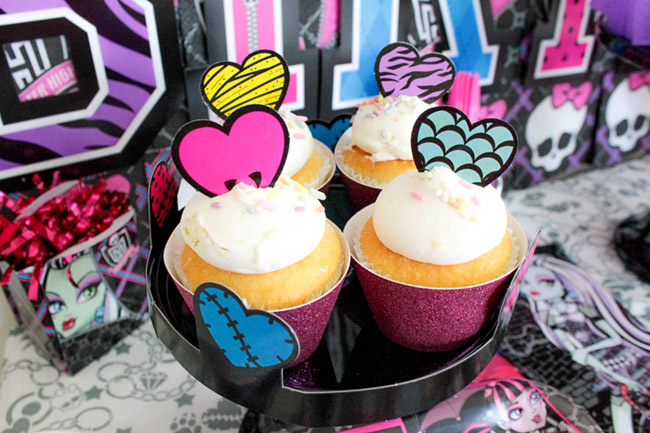 Our pink glitter cupcake wrappers were the perfect touch to make them more Ghoulish! 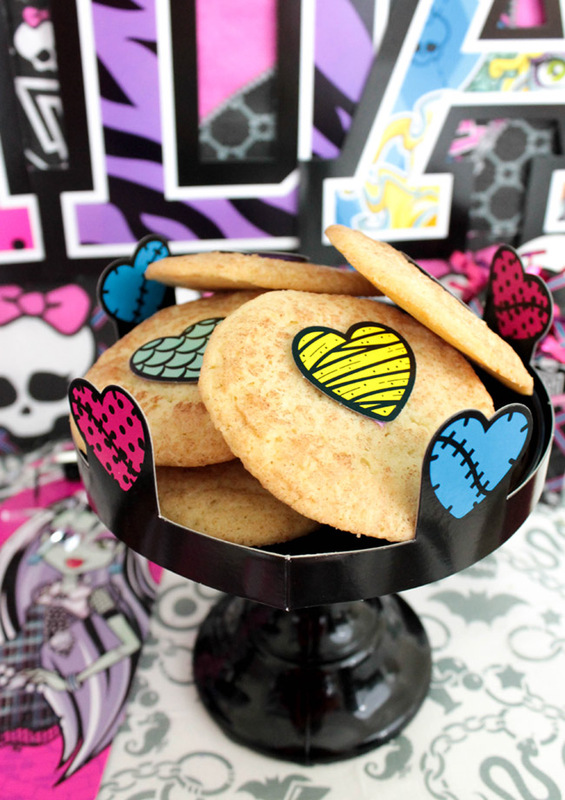 The heart toppers are from the Monster High centerpiece kit that we were talking about above. We love using party supplies in new ways to bring a new twist to a party look! We used those same hearts to top our cookies too. Just dab a bit of icing on the back of them and stick them on. They just add a bit of flair to the cookies that we love! 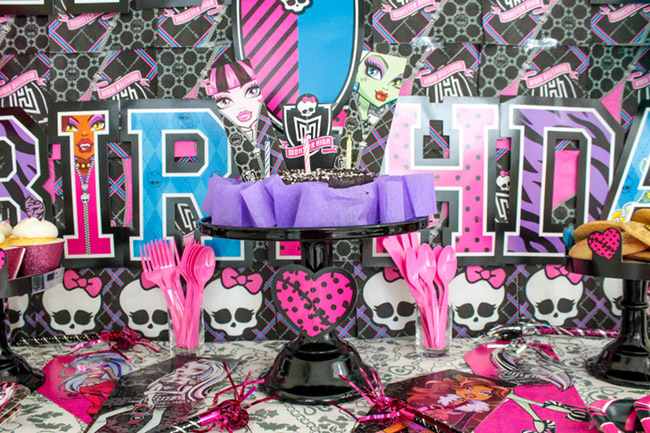 Those are just some tips on how we would throw a Monster High party. We would love to hear how you threw yours! 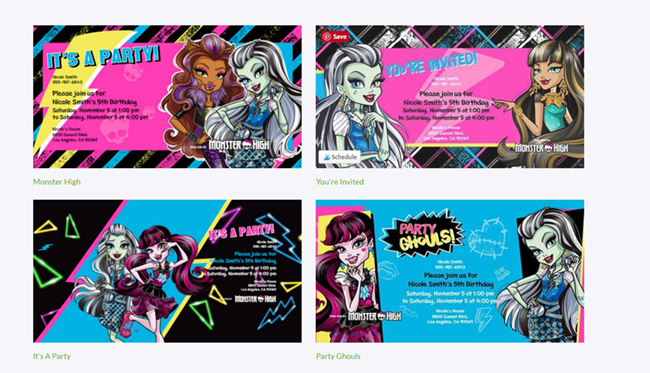 Don’t forget to start your party with an Evite Monster High invite. It could win you $250! Bring The Photo Booth To Your iPad With Evite! Say Yes To Summer Pin It To Win It Contest! Win A Vacation For Mum For Mother’s Day!